Leave for Pagosa Springs in the morning where I intend to get in some serious mountain trail miles. Laundry seems to dominate preparing for vacations. There are other chores. Servicing the car. Prepping the bike. Planning the dinner we will cook when it’s our night. Printing hiking maps. Gathering hiking gear. But it’s mostly about laundry and then packing. Although I found time to meet up with my buddy Jim at the Tasty Weasel for happy hour. There’s always time for a tasty beverage. The big story tonight though is on alternate driving plans and trail routes due to the West Fork San Juan Fire near Pagosa Springs. They’ve closed Hwy 160 between South Fork and Wolf Creek Pass. In fact, they are currently evacuating the entire town of South Fork. We’re still driving down Hwy 285, but this will re-route our drive through New Mexico. We have to drive out of the state to flank the flames and come back up into Pagosa Springs from the south. That’s fine – looking forward to lunch in Chama. My first planned hike was to be with Keith and Rob starting from Wolf Creek Pass heading south along the Continental Divide Trail. I hiked the 500 mile Colorado Trail from Denver to Durango with Rob in 2011. The first segments of that trail are currently blocked due to a fire near Denver. Rob is hiking the CDT currently in segments, under the trail moniker La Plata. I joined him on a segment or two late last year and thought it would be pretty cool to get in a segment on this vacation. Now I’m not so sure it will work out. The CDT is on fire including Wolf Creek Pass. We’ll still meet up and find an alternate route. I mapped out a handful of trails for Keith and me to hike/run throughout the week. I’ll mountain bike some too with Karen. The best looking trail has a viable slope for biking up to the Continental Divide with natural hot springs along the route and numerous wooden bridges across the creeks. This is the West Fork Trail and is at ground zero of the fire. I suspect another trail on my list, Windy Pass Trail is out too. But Pagosa Springs has a seemingly infinite number of trails so don’t worry about me. I’ll be trail running somewhere next week. 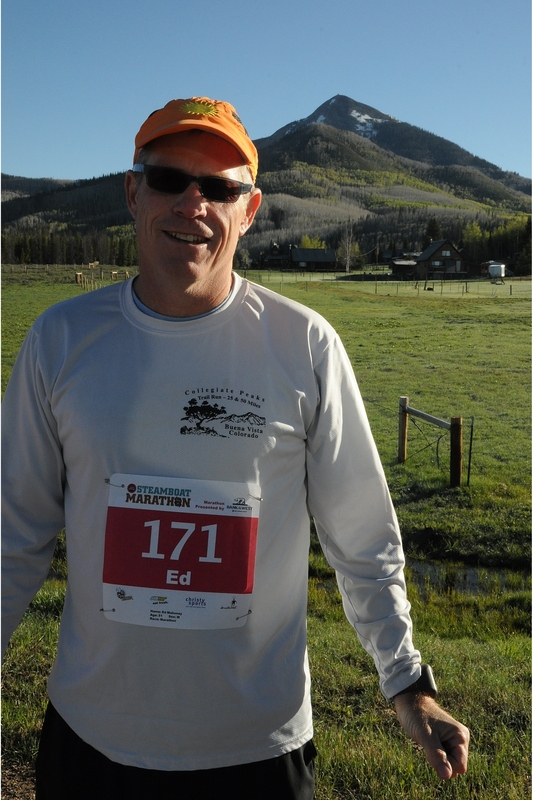 This pic above is of me freezing my tail off at the start of the Steamboat Springs Marathon earlier this month.